Please welcome our Saturday storyteller, Shona. She's talking about her upcoming release and getting romantic! Shona Husk and I live in Perth, Australia. 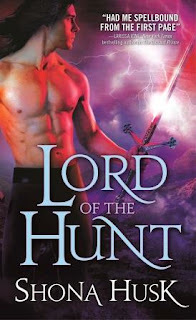 Lord of the Hunt was released on January 7 and it’s the second book in my Annwyn series (book 1 was The Outcast Prince). Set between our world and the fairy world of Annwyn the series centers around the dying King and the failing magic. Each book has its own hero and heroine. In Lord of the Hunt the hero and heroine discover just how treacherous the Court can be even for those with power. Digging into the fairies schemes and power plays was a lot of fun! Everywhere. Pictures, newspaper articles, mythology or even random conversations. The Annwyn series was inspired by a discussion on mazes, and what they could be made of, with my kids. They thought a maze couldn’t be made of glass…I immediately imagined a place where you could see what you wanted but had to follow a complicated set of rules to get it—the fairy Court of Annwyn was born. Firstly the heroine has to find him attractive, as it’s through her the reader finds the hero attractive. Since first impressions count he has to look the part. For some heroes this might mean a suit and tie, for others jeans. Verden the hero of Lord of the Hunt is very pretty like all fairies, but Taryn notices that he doesn’t dress as flashy as the rest; he doesn’t quite fit what she expects for a man of his rank. I like to run (something I never thought I’d say but after taking up running 18 months ago I’ve come to enjoy it), read, do cross stitch while I watch TV. Dark chocolate. I love it and I eat far too much of it….thus the running. What’s your idea of a perfect romantic evening? Good food, good wine and my hubby. What do you do to get in the mood for writing love scenes? Candles, music etc? I don’t do anything special I just write. Sometimes it’s really easy and the words flow, other times its hard work. If I really can’t get in the rhythm I make a couple of dot points about what the characters learn or how they change and I jump to the next scene. I usually go back the next day and fill in the gap. Shona Husk lives in Western Australia at the edge of the Indian Ocean. Drawing on history, myth and imagination, she writes about heroes who are armed and dangerous but have a heart of gold—sometimes literally. She is the author of the Shadowlands Series and the Annwyn Series. You can find out more information about Shona and her edgy romances at http://www.shonahusk.com/ or follow her on Twitter, @ShonaHusk. Hot Hump Day Excerpt - Saved by a Rake.